Recommendation engine Hunch usually asks you a few questions and can then help you decide things like whether or not you’ll be happy with a porsche. Or they can look at data another way, and show that TechCrunch readers tend to be optimists, for example. But sometimes Hunch likes to show off a little and prove that they know you even before you answer those questions. Their Twitter game was one example. Now they’ve released a Facebook game. Hunch will predict your answer to questions like whether or not you like comic books (it nailed it, I just don’t like them). 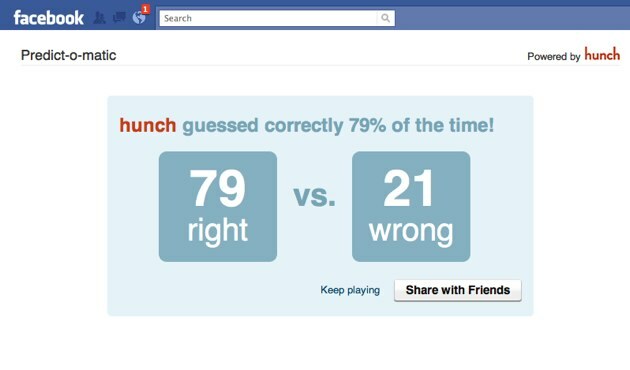 And that’s without any tuning to start – Hunch just looks at your Facebook likes and makes its predictions from there. Play Hunch Predic-o-matic on Facebook here. It’s eerily accurate. During beta testing with 30,000 or so users they’ve seen 83% accuracy for U.S. users and about 75% for non U.S. users. The data, says Hunch CEO Chris Dixon, comes from 400,000 Hunch users who’ve logged in via Facebook Connect and have answered around ~150 questions each. That’s created the Hunch “taste graph” and served as a starting point for their prediction engine. “As more people use Hunch (either on hunch.com or via our API) we collect more data and the system gets smarter. The Predictor Game is meant to be a tech demo but we can also use the same technology to recommend practical things like restaurants, movies, clothing, gifts, travel destinations, daily deals, etc.” says Dixon. The best thing about the game is when you subconsciously lie, answering what you want to be true about yourself, and Hunch comes back with the actual answer. Sure I like to think of myself as the kind of guy that’s passionate about hiking. But in reality, not much hiking actually ever happens, and Hunch knew it. Oh Hunch. You just get me.